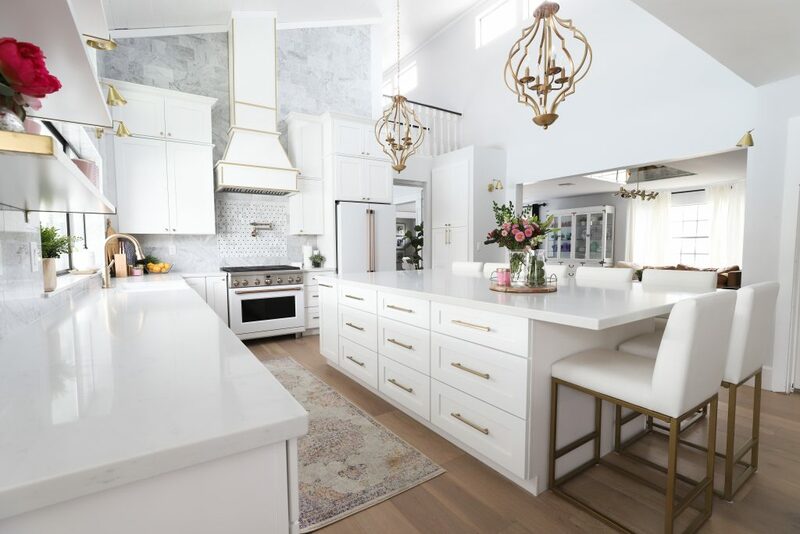 A kitchen remodel can be hard and can have challenges for sure. But now that it is over I can say it is all worth it! This post is sponsored by Home Depot but all opinions are my own. 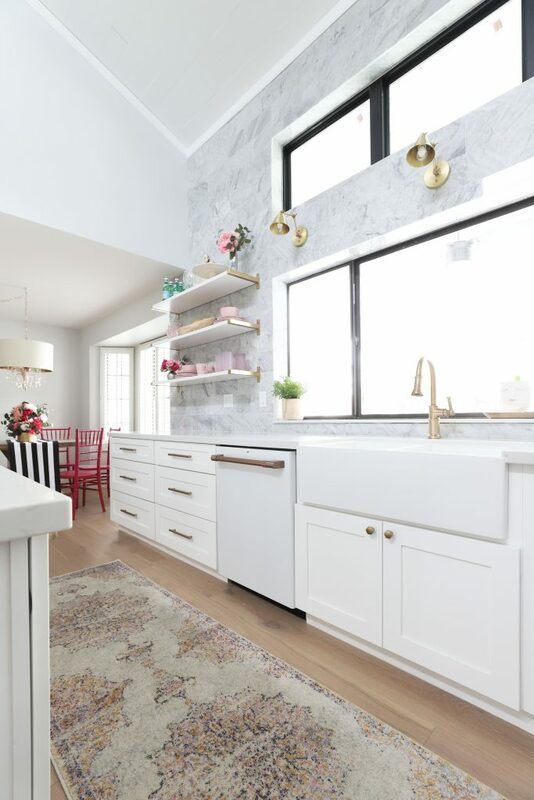 This kitchen remodel has been a labor of love that is for sure. When our kitchen flooded at beginning of November things got crazy really fast. 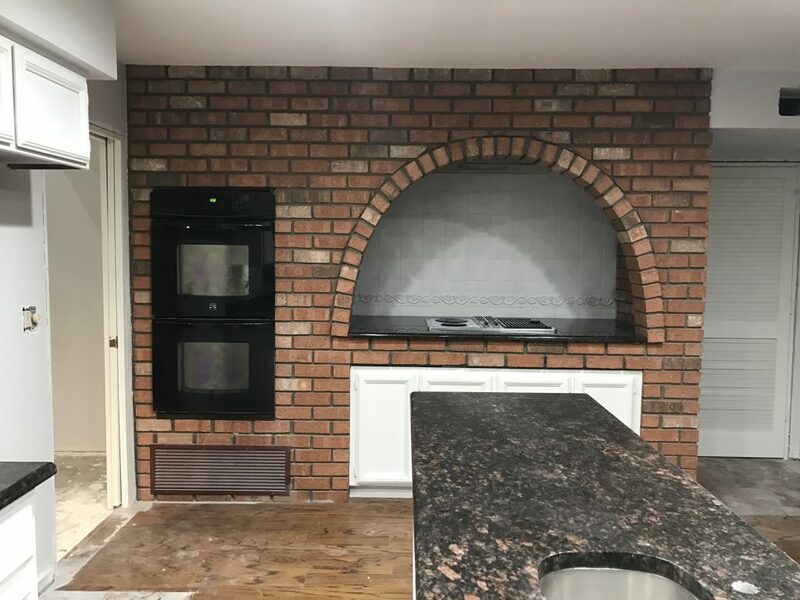 When we bought the house we knew that we would have to do a kitchen remodel but we were not planning on it anytime soon. Especially since we had just finished our backyard. But when life gives you lemons and forces you to demo your kitchen right before Thanksgiving you go for it and boy did we! Our fridge leaked and we notice our hardwood popping up one afternoon. When we pulled the fridge out we then realized that the leak had been going on for awhile and it had ruined the cabinets from the fridge to the sink and also had ruined the wood all around. I will go into more details of the process and our game plan with the kitchen in a later post but today it is all about the pretty stuff. Before the flood we had already changed the kitchen so much. We had painted the cabinets and did a DIY Stencil on the wall. You can see a post about that HERE. 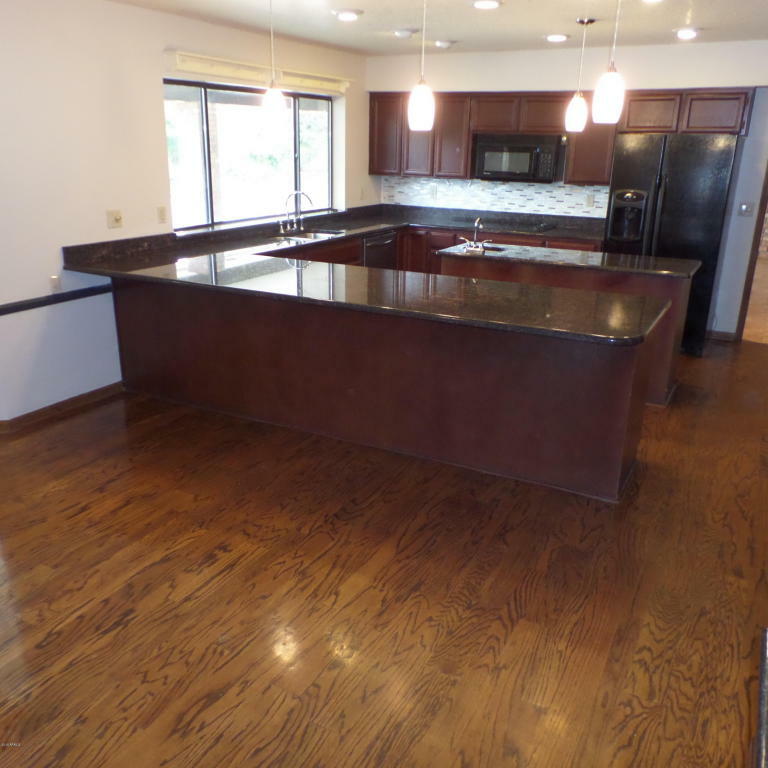 A kitchen remodel can be hard but I still can’t believe this is our new kitchen. I honestly had no idea when we bought this house that this is what my kitchen would look like one day. 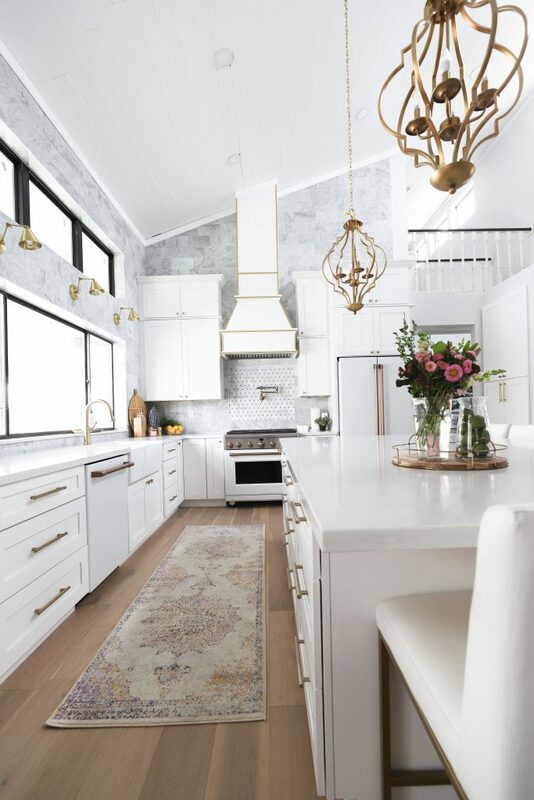 We did remove the ceiling which was actually a little room upstairs and that was 100% my husband Kyle’s idea but we have big plans to one day add on a second story which I will also talk about in a different post but today I want to share all the sources of our kitchen. There is A LOT to talk about so let’s talk about the pretty and fun stuff. I am loving my new appliances. Home Depot is our go to for appliances. So when I was looking for our new appliances we headed to Home Depot. In store I was able to see the different sizes and options that they had for appliances. When we shop for appliances we always write down or keep in mind a few of our must haves. 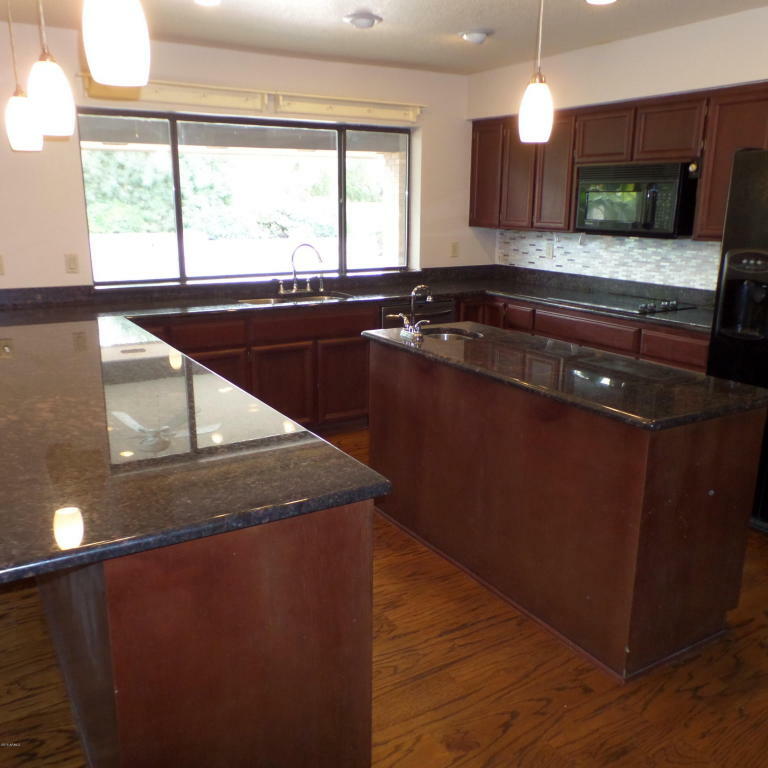 We had a few must haves, I wanted white appliances, and I knew we wanted a counter depth fridge, and a 36 inch range. 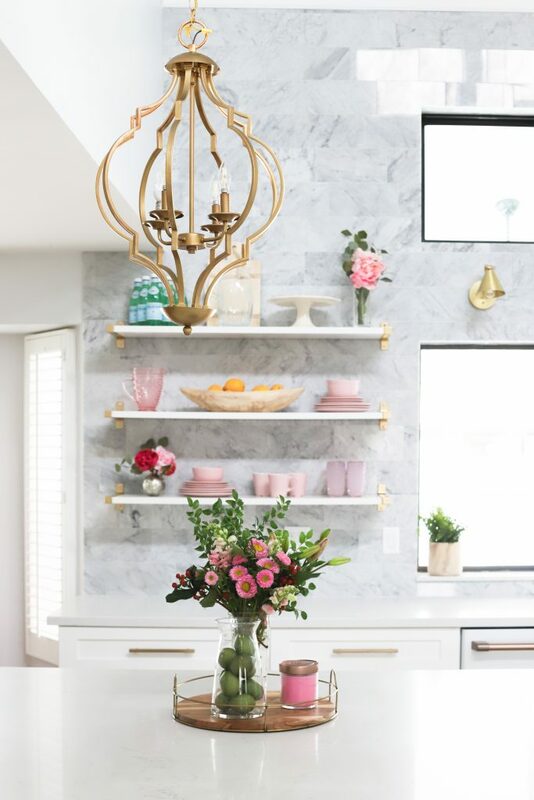 When I came across these stunning Cafe Appliances from Home Depot I was head over heals in love with them! Like over the moon, could not stop thinking about them in love with them!! 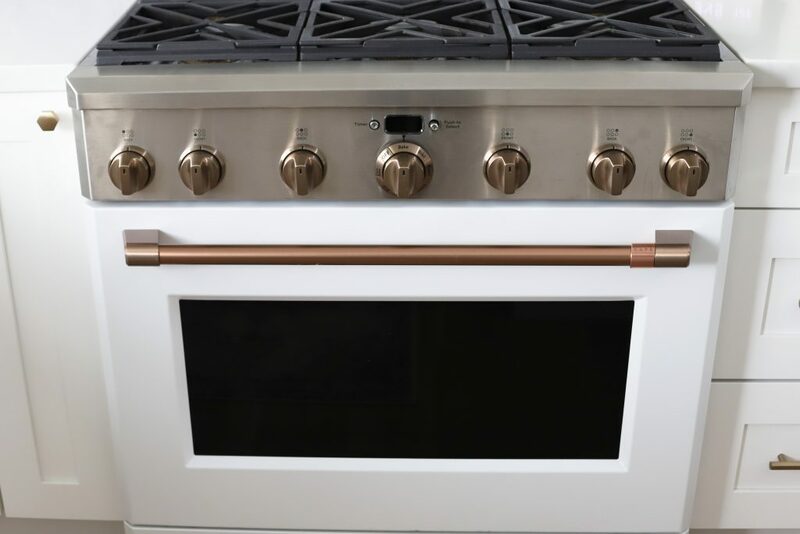 One of the best things about these appliances is that you can change out the hardware. 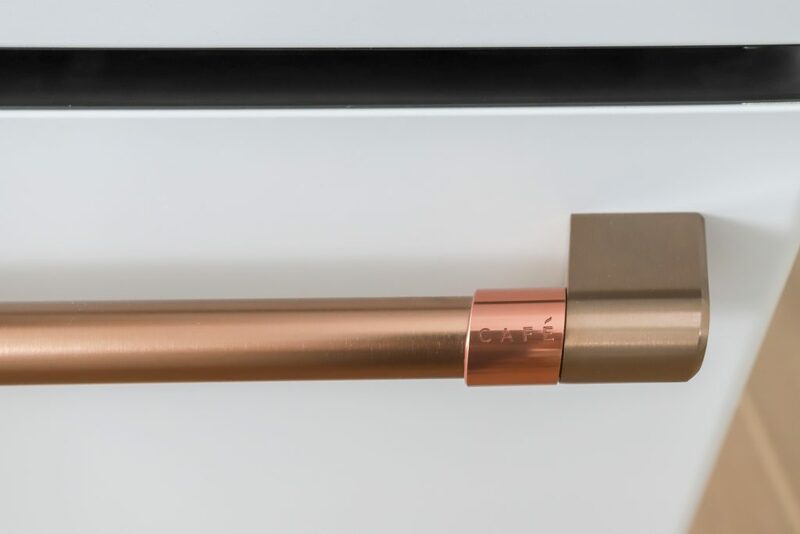 They have a few different options, they have brushed bronze, brushed copper, brushed stainless, and brushed black. 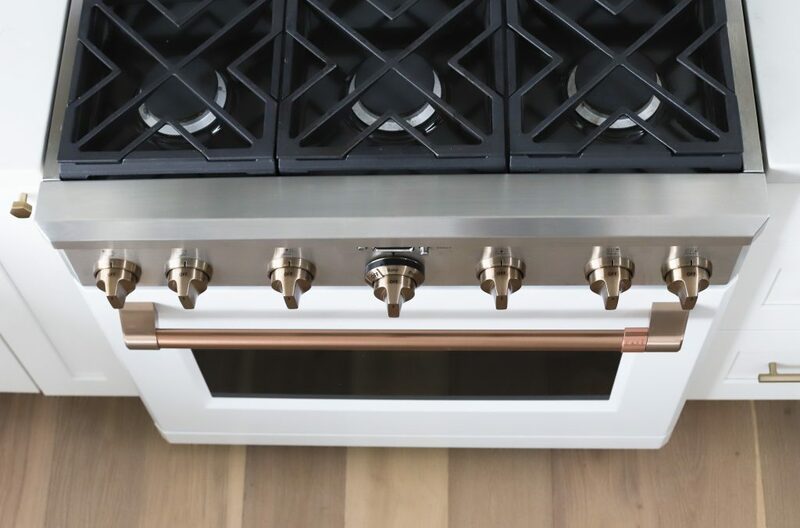 Since I was going with the white appliances it already came with the brushed bronze hardware which is what I would have switched out to anyways. I just love that there are different options I think it’s just so smart and creative. When I was looking for a range there are two things that were a must have, we really wanted a Duel Fuel Range and we wanted a 36 inch range. This GE Cafe 36 inch Duel Fuel Range is perfection. 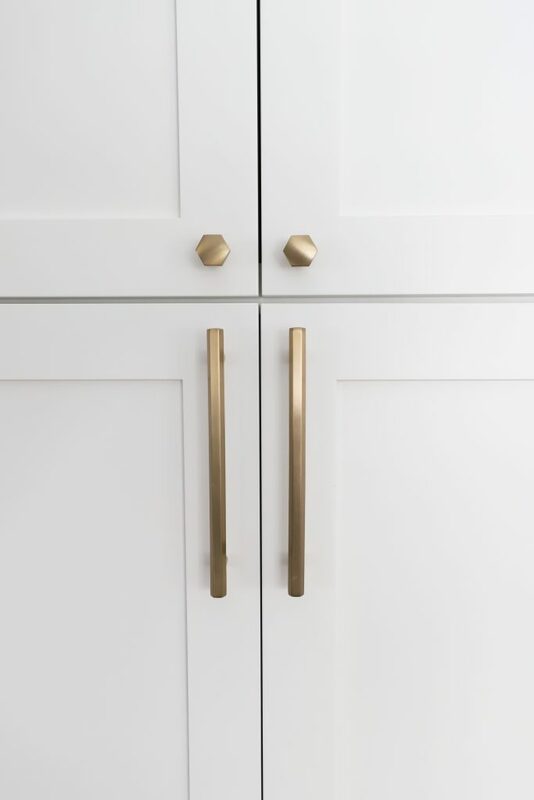 I fell in love with it and I loved the brushed bronzed handles and knobs. My husband has always wanted a gas range and this range has to be my favorite thing in the kitchen. Not only is it totally stunning the quality is just top of the line and I feel like I am a professional chef using it. When I was picking out the refrigerator I wanted a counter depth refrigerator. 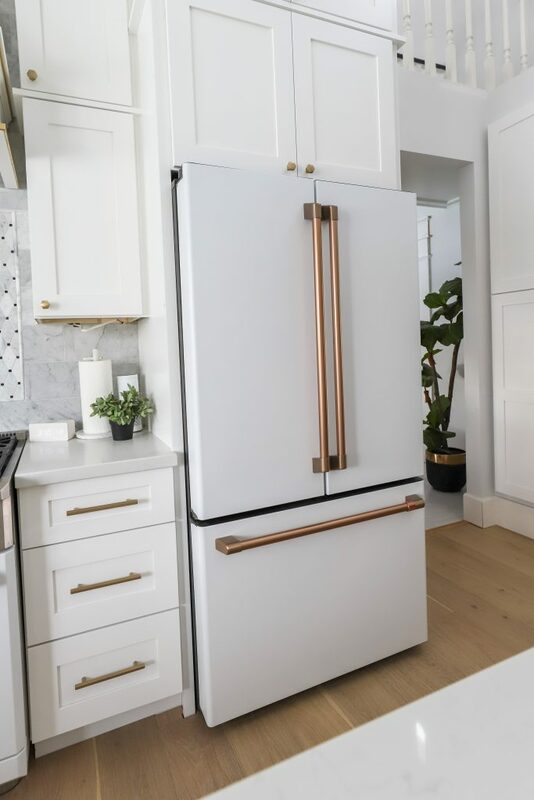 I went with the french door matte white GE Cafe Refrigerator. I love that there is so much storage and everything has a home in this fridge which makes things inside the fridge so easy to organize. For the dishwasher I wanted it to match the rest of the appliances and I must say the GE Cafe Dishwasher is so quiet, when I am standing right next to it I can hardly hear it and it has so many cool features. Where the silverware goes it has little sprayers that cleans the silverware. It also has great storage. 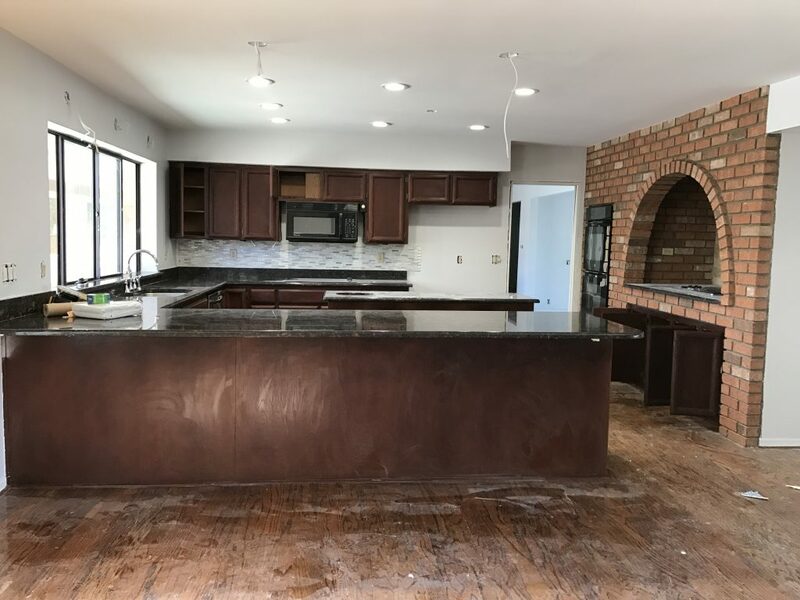 We got our cabinets and hood from Sollid Cabinetry Company and we had Justin from Big Horn Cabinetry Az do our layout, order the cabinets and also our install. I can not recommend Justin enough, he walked us through the different options we had and he helped us pick everything out including some of the cool different features and options that the cabinets have. Which I will go in more of that when I talk about my kitchen organization in a few weeks. 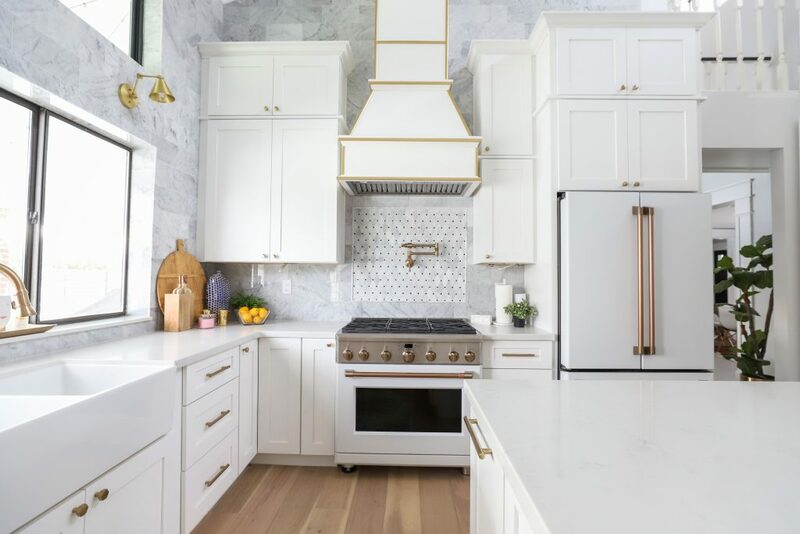 Also, the range hood is also from Sollid Cabinetry, Gold trim is a DIY Project. Will share DIY tutorial soon. 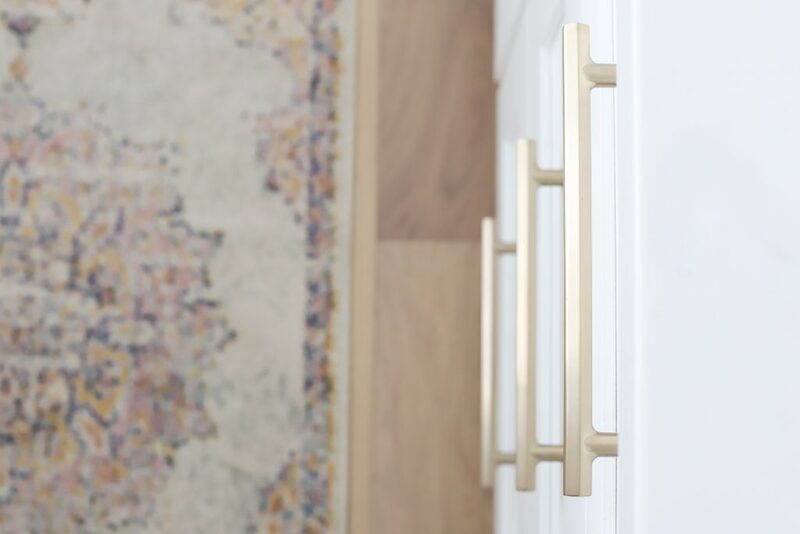 Cabinet hardware can be hard, it’s hard to drill holes into perfect and new cabinets. 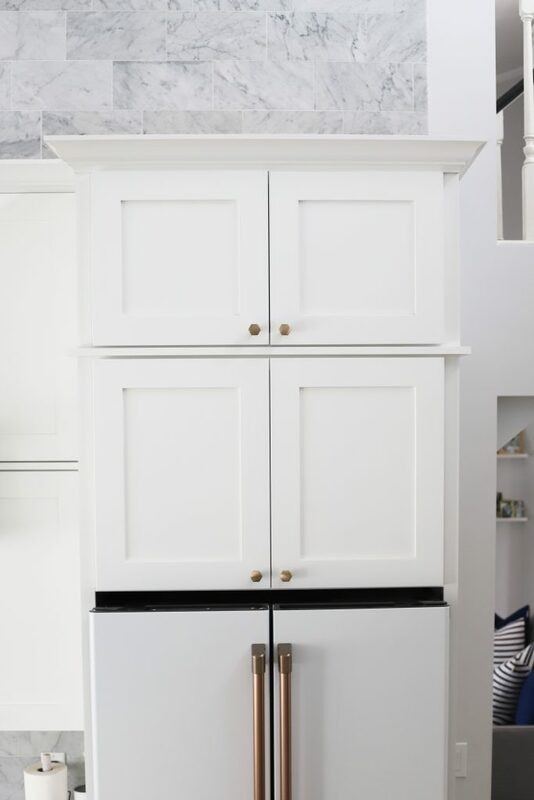 When I was looking I knew I wanted a larger pull because most of my cabinets are so wide so on my larger cabinets I went with THESE 8 Inch pulls and then on the little bit smaller drawers I went with THESE 6 Inch pulls and for the knobs I went with THESE hexagon knobs. 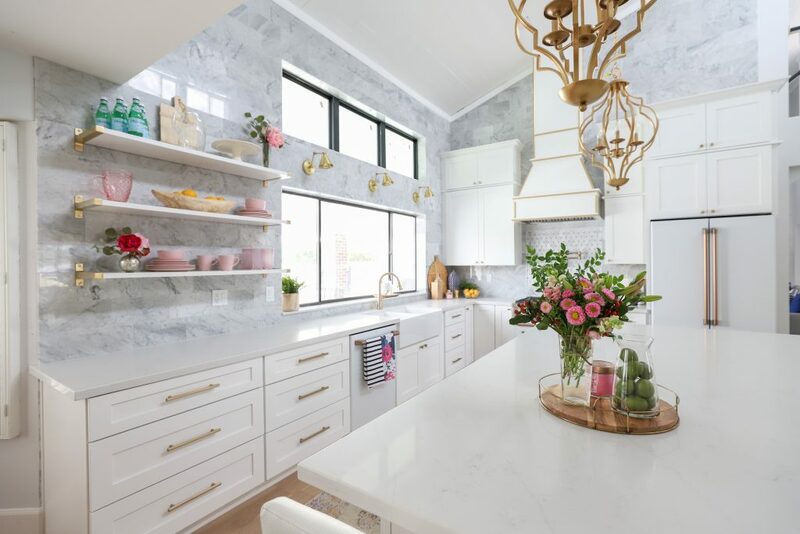 With the countertop I knew I wanted Quartz and I wanted a marble look. At Mallory’s last house in her Kitchen she did these countertops and I LOVED them so I ended up doing the same thing. 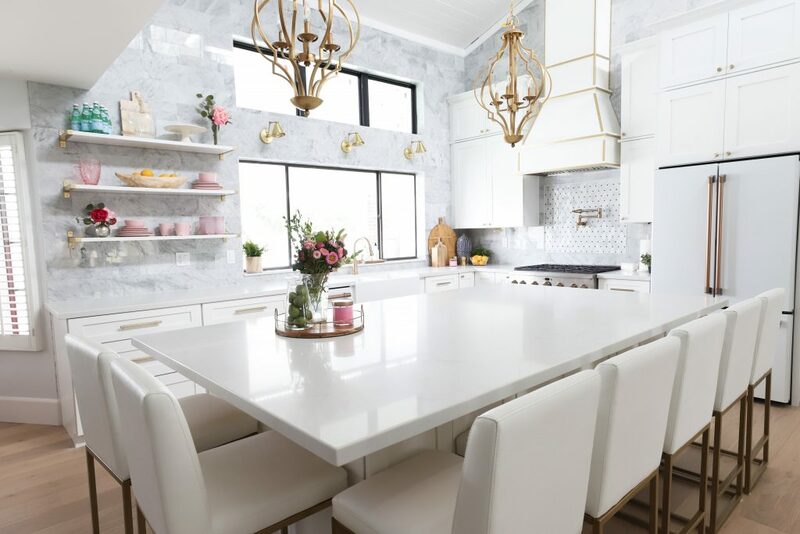 Quartz Arizona Tile New Carrara- Fabricated and Installed by Desert Sky Surfaces And I am soooo in love with them. Unfortunately, they’re being discontinued but if you go to a countertop company and tell them what they are then hopefully they can find something close to it. 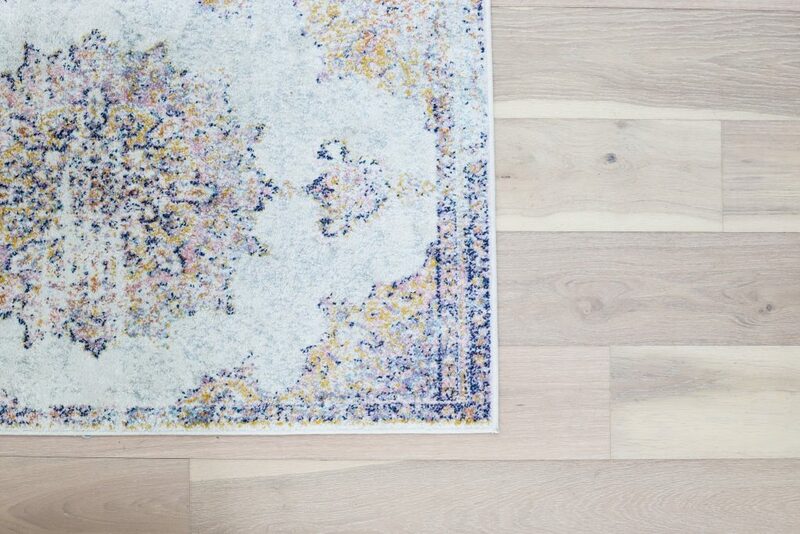 Flooring was the hardest thing for me to pick during the kitchen remodel. There are soooo many different options. I was going back and forth between Luxury Vinyl and Hardwood. And my budget was tight. I knew I needed to be in the less then $5 a square foot in the cost of the actual hardwood so I was limited. 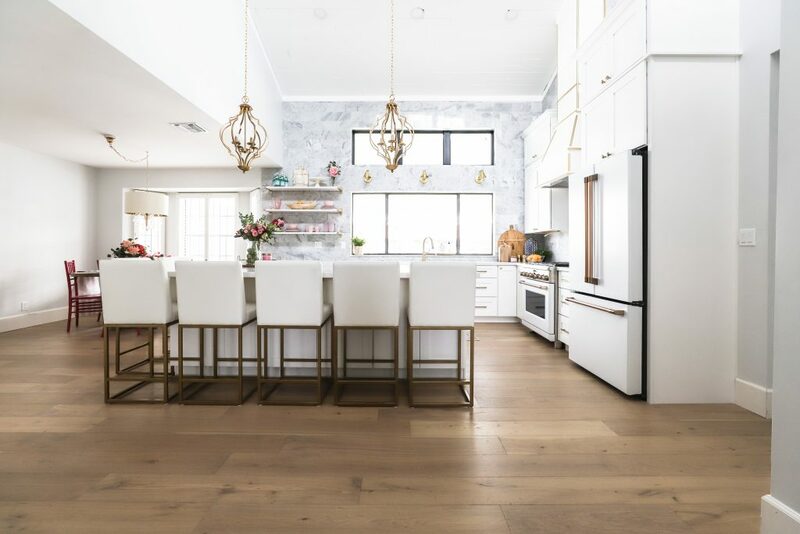 I met with a vendor in Phoenix that I got his information from a friend and he had a ton of options and I fell in love with the EUROPEAN OAK SHELL BEACH by Garrison. 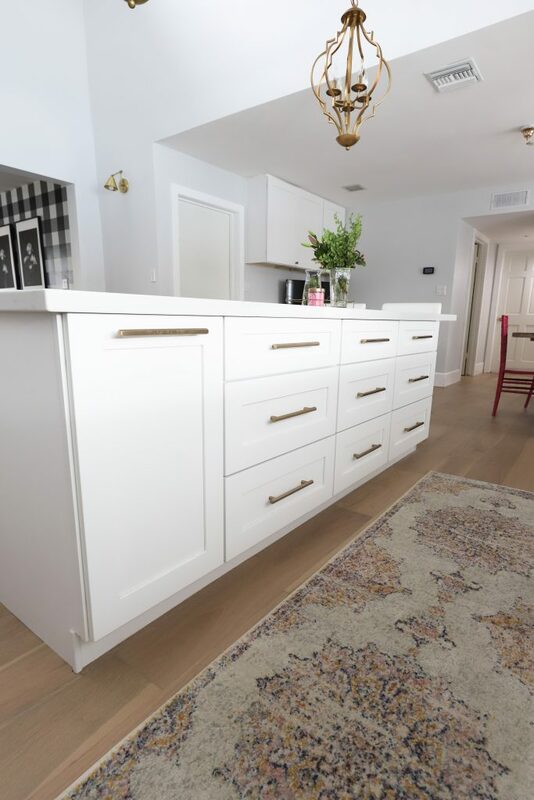 After I had been looking at and ordering a million different samples for a few weeks prior the second I saw the EUROPEAN OAK SHELL BEACH by Garrison I knew it was the perfect fit for me. 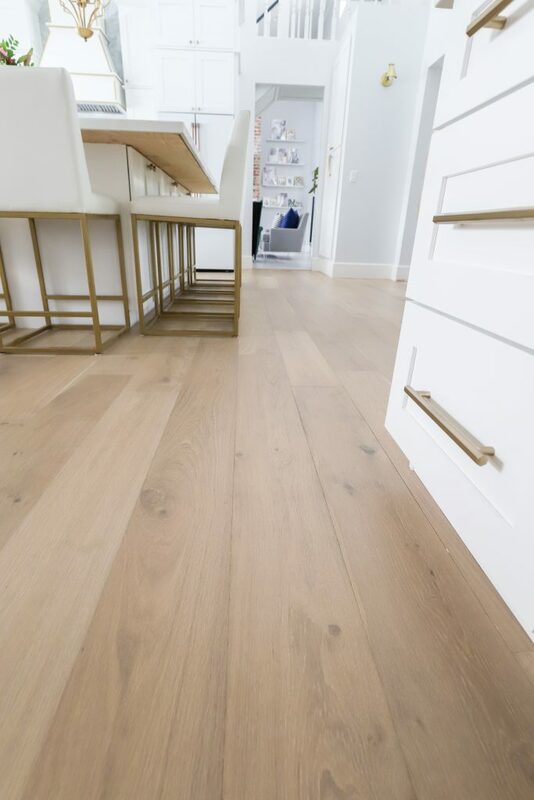 There is movement in the flooring but not too much and the tone is warm without being to warm and I love that the planks already come in all different lengths. And going up against the white tile it just looked so pretty. I ended up ordering from Garrison directly and they were so great to work with and shipped very fast. 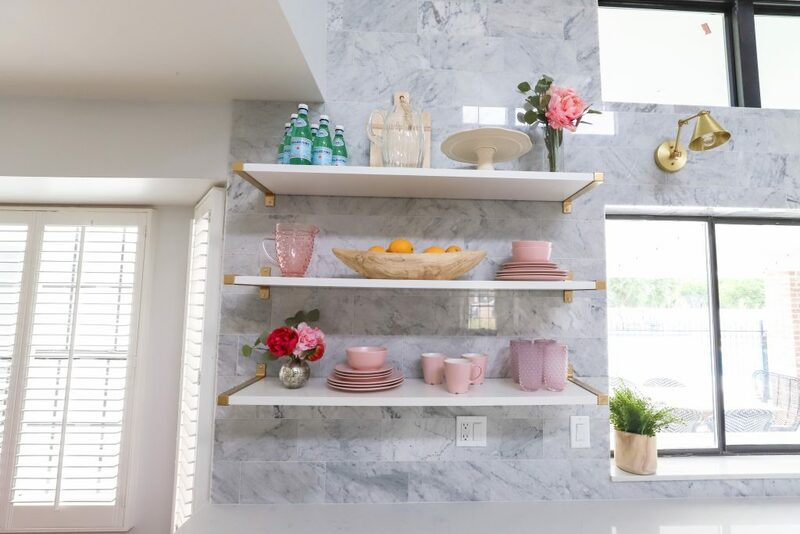 I love marble and I love Mallorys kitchen tile so much!! 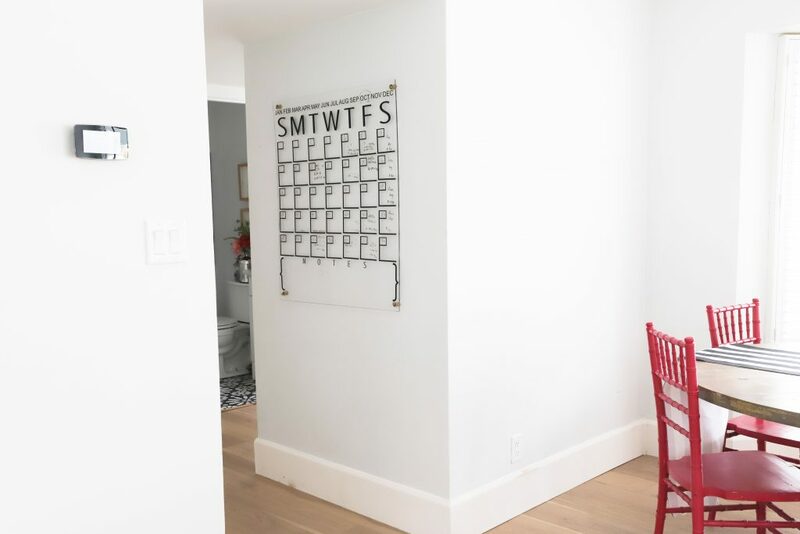 So I knew I wanted something like it but because I had such a large area to cover I was leaning more towards a large scale subway tile. I found THIS 6×12 inch marble tile from Floor and Decor. And I really do love it. 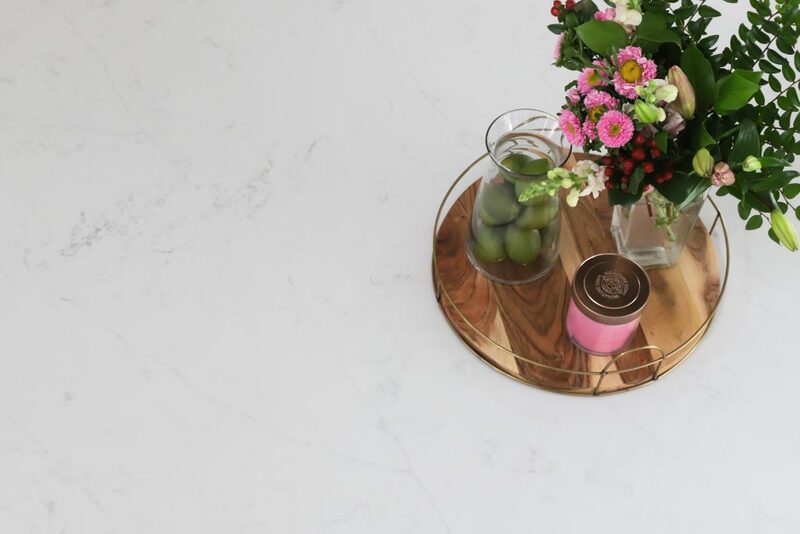 The tricky thing about marble is that none of the pieces are the same. I did end up buying extra and I picked out pieces that I did not love and some of the pieces were too dark so I don’t be afraid of marble just don’t use the pieces you don’t like. One thing I knew I was going to miss a few things about my last kitchen which you can see HERE what I miss is that I had a patterned wall. So I knew my all over tile pattern would be a bit too busy I did want to find a patterned tile for just over the range for a little accent. 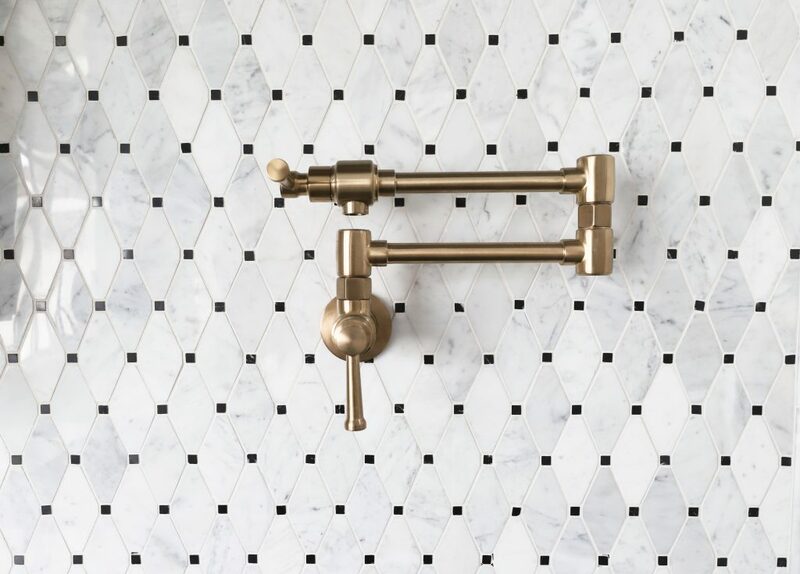 I have loved THIS pattern and tile forever and I love that it went so well with the marble subway tile. We love Elkay! We love the company as a whole and we love their products. In my last kitchen I had an Elkay prep sink in the small island. 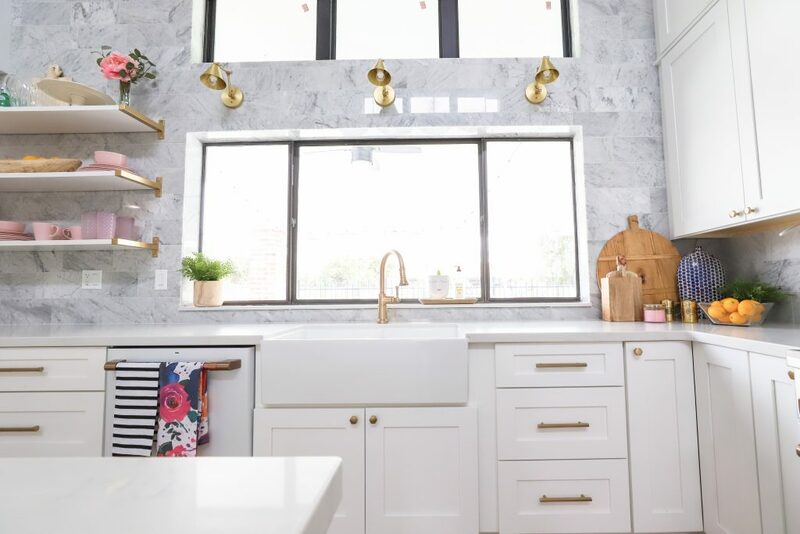 You can read and watch all about my love for the kitchen sink HERE and why a sink and a beautiful space I love is so important. 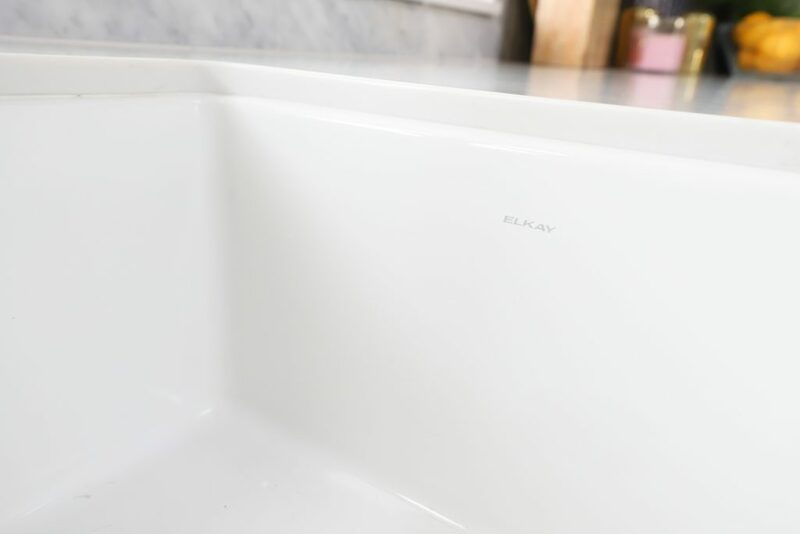 I knew when I was getting a sink it had to be Elkay. 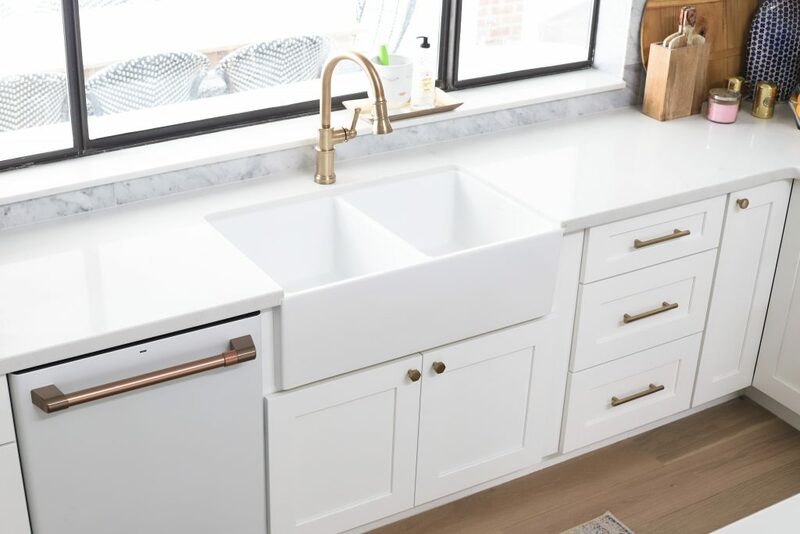 I wanted a farmhouse sink and I went with the Fireclay Farmhouse sink and I love it! I got my kitchen pendants from Overstock. The color was a bit more aged then I wanted so I spray painted them with Rustoleum Metallic Gold Spray Paint. 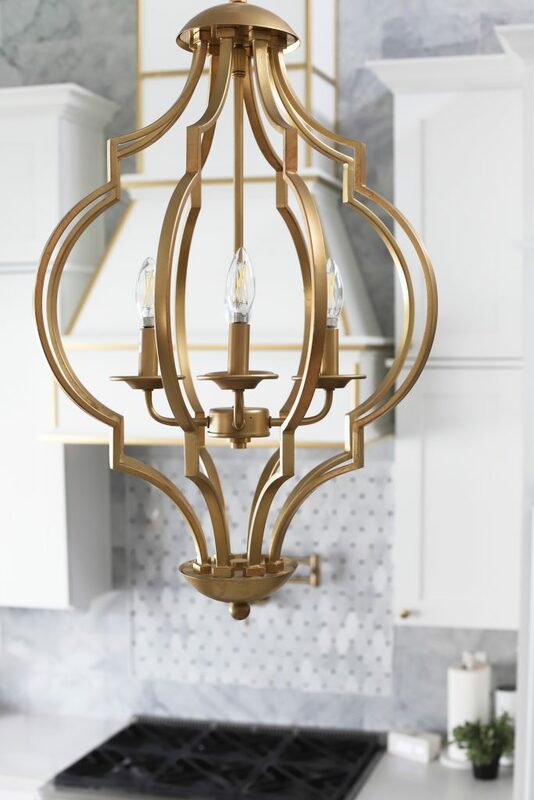 The Chandelier above my round Breakfast Nook Table is the Gold Crystal Ceiling Lamp. 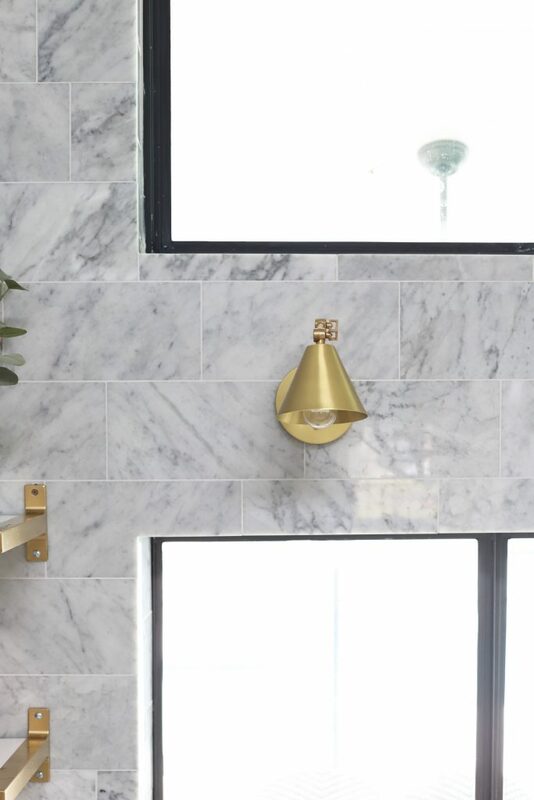 I love these Gold Sconces above the window from Lucent Light Shop I have them all throughout my house. They are the Peak Sconces in Gold. 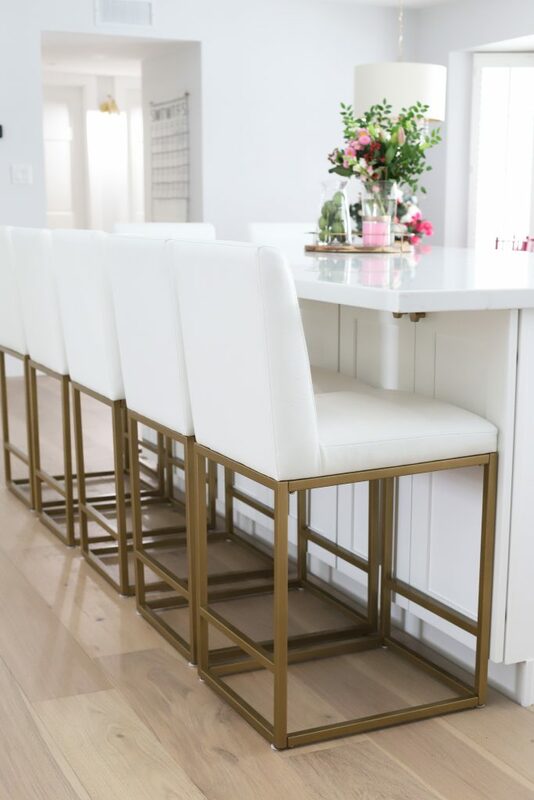 When it comes to barstools I truly believe that we have created the perfect ones! Our barstools are very kid friendly. 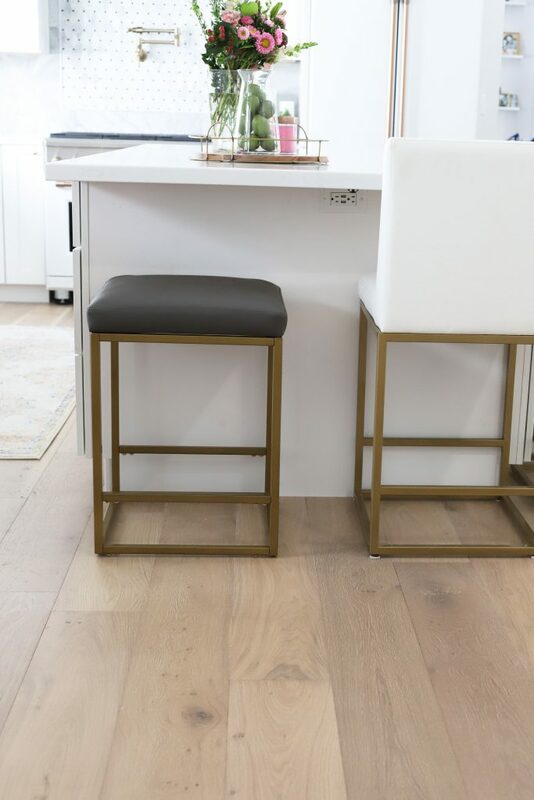 Our barstools come with a back and we have backless. 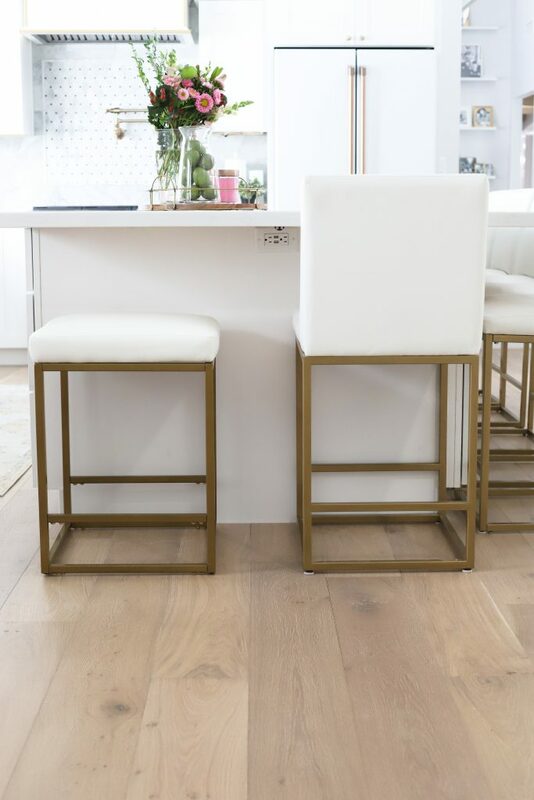 The barstools that come with the back come in white and our backless barstools come in grey and white. You can check out the barstools as well as other things in our collection HERE. 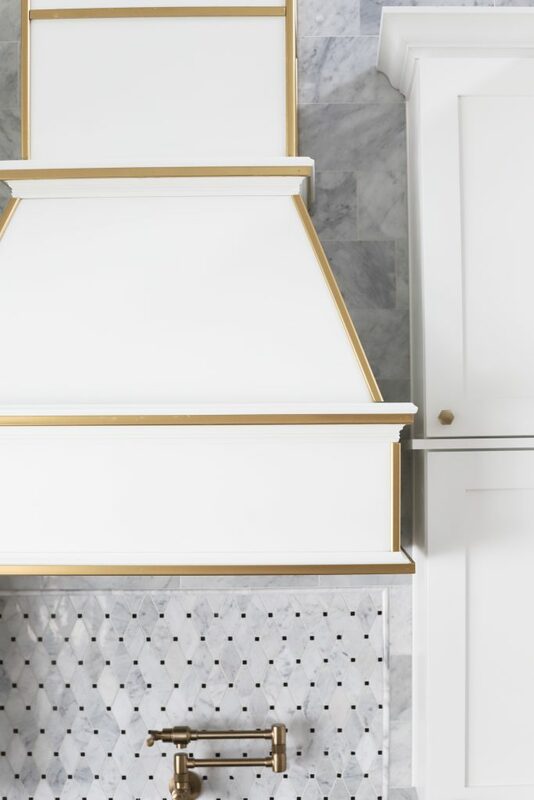 Range Hood: Sollid Cabinetry, Gold trim is a DIY Project. Will share DIY tutorial soon. 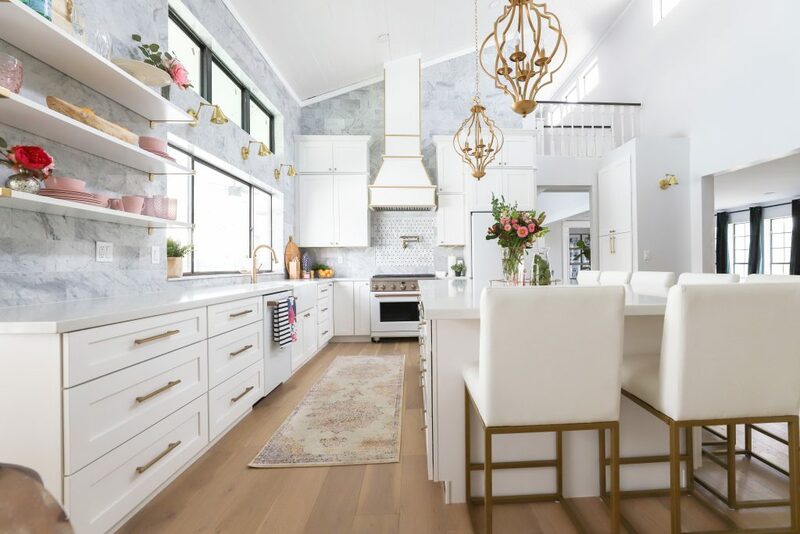 Pendants: Kitchen pendants from Overstock. It’s basically perfect in every way! So happy for y’all! 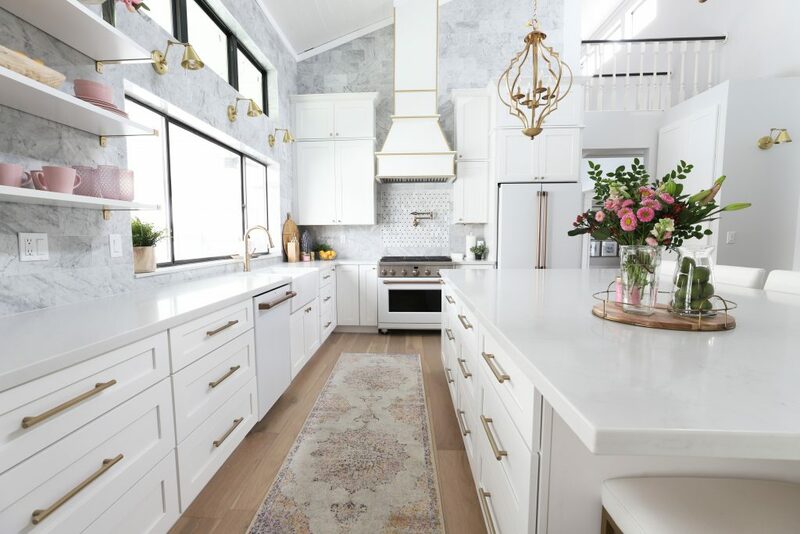 The kitchen is gorgeous. I hate to be “that person” but the spelling and grammar issues abound and just FYI but all your Home Depot links have a strike through (at least on mobile anyway). Seriously envious over those appliances!! Just gorgeous! What a dream! Love the appliances! 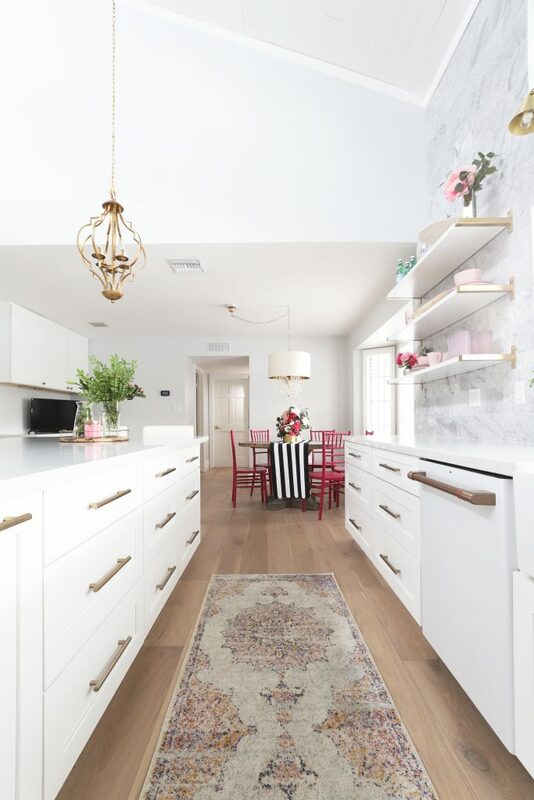 This kitchen is legit so dreamy and I’m so happy for your family to get to have such a great space. Wow!!!!! Everything is gorgeous and all of your gold accents really pull it together. You’re amazing! Can you tell me the size of your island?!! So beautiful! Thank you for sharing your journey too. 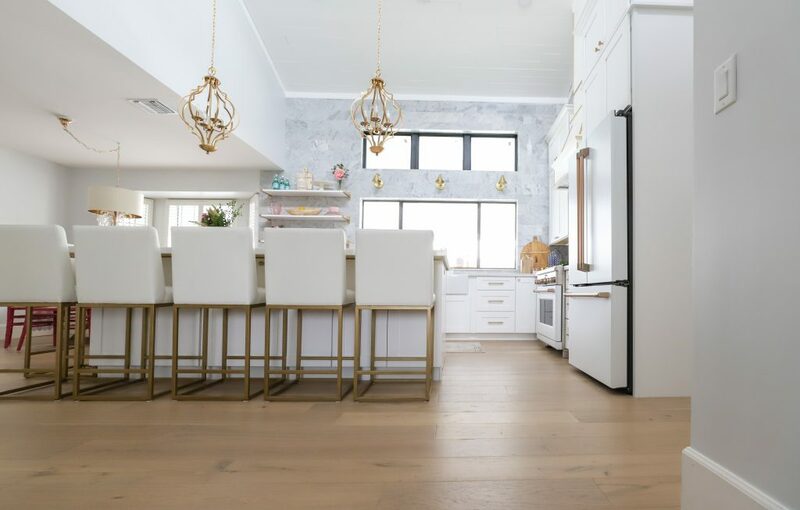 Love the floors, appliances, tile, ugh, love it all! The barstools 😍😍! Can’t wait until we purchase our next home so we can attempt some projects of our own. You two are so encouraging even for a beginner. Thank you for all you do!! I can’t believe the transformation! It is beautiful!! Gorgeous! It’s so bright in there! I absolutely love your range and you picked the best runner! The color palette is great. Wow, what a transformation! It is so pretty! Love e marble, footed bathtub, pretty flooring! 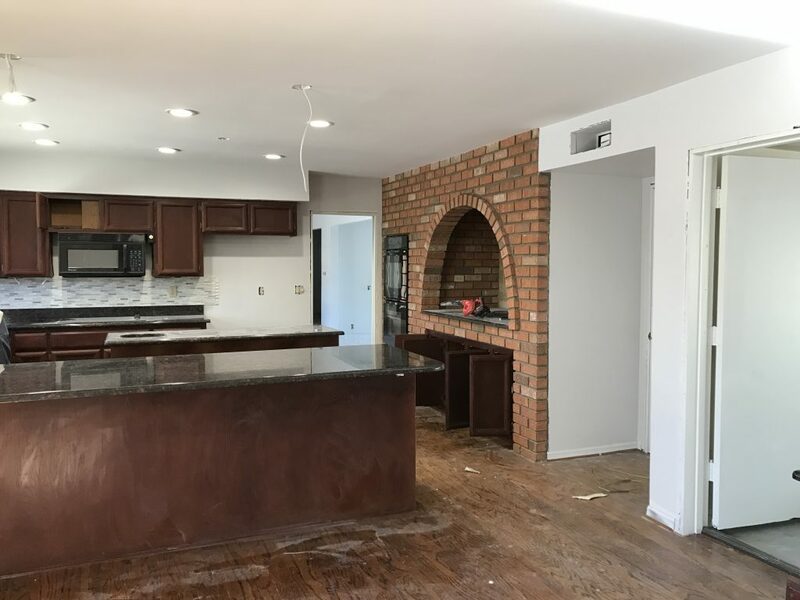 The exposed brick is a nice feature too! Hey Mallory, absolutely love the renovation! The photography does a fantastic job of capturing all the hard work that was invested. What did your design process look like? 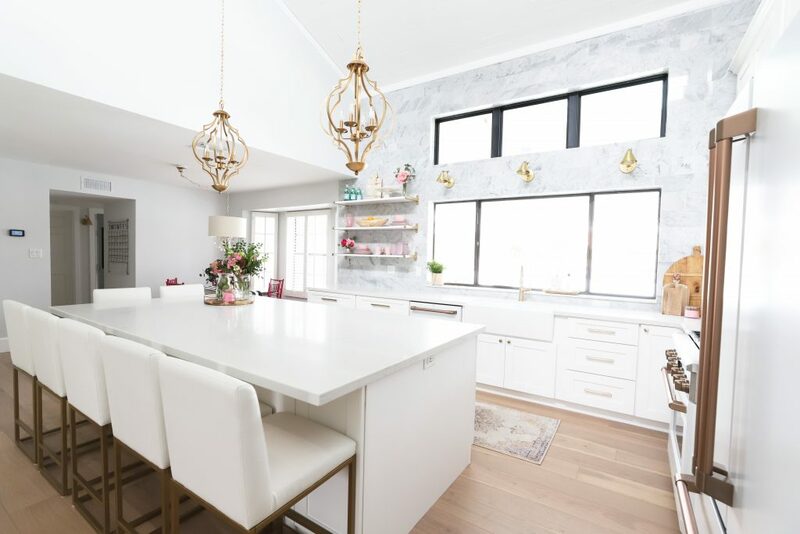 It is one of a kind kitchen that stands out, and I’d like some insight — also, kudos to your husband for the idea of removing the room to create the extra space. 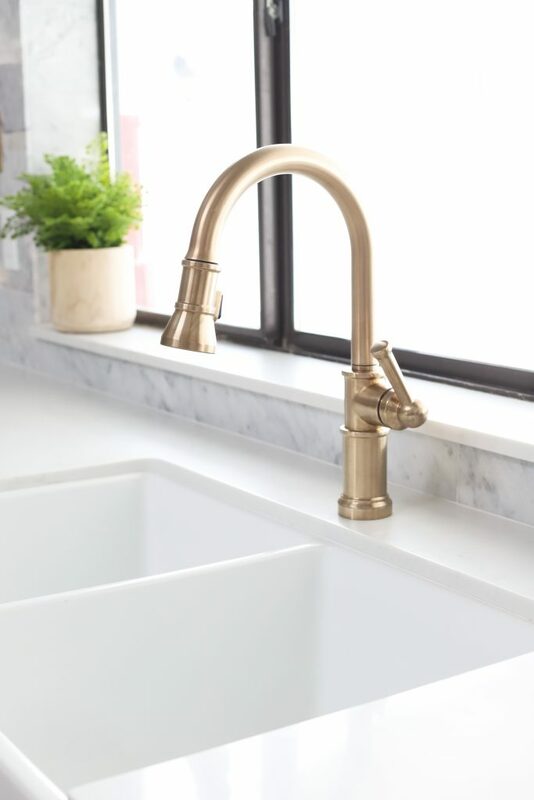 I see you went with the Elkay Fireclay farmhouse sink. A trusted brand that offers excellent stain and heat resentence. I want to add that not all fireclay is the same. If you’re shopping around, it’s important to do your research check the reviews and more importantly the history of the brand. There’s a lot of poor reviews on fireclay being easily damaged or uneven. This is the fault of the manufacturing process and not fireclay itself. I’ve started following you so I can stay up to date. It would be great to use you as an added resource.